Happy 53rd Independence Day to all the Nigerian folk out there. 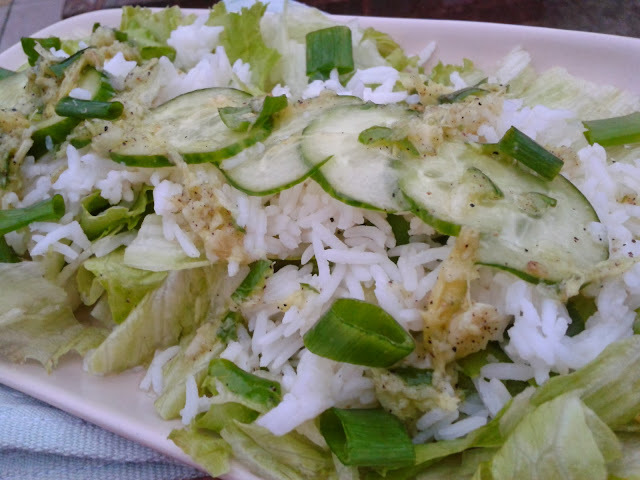 To celebrate, why not rustle up this excessively patriotic looking salad to go with dinner tonight. You know you want to. 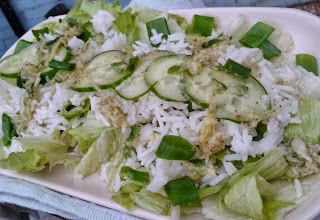 To make the dressing, place the green chillies, garlic and ginger in a small mortar and crush to a pulp with a pestle. Add the olive oil, salt and black pepper and mix with a spoon. To build up the salad, place the lettuce leaves on a serving dish, sprinkle the rice evenly over the top, layer on the sliced cucumbers and garnish with the chopped spring onions. Drizzle the dressing liberally over the top and serve immediately.